Discounted – BLOOD PRESSURE CUFF- LARGE ADULT | Medical Supplies and Equipment. 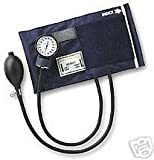 Large Adult Blood Pressure Cuff with nylon case. Being a registered nurse I know what a large bp cuff should be. This cuff was not “large” in any way. Large cuffs should be both longer and wider than a regular sized cuff. Both of these criteria were not met. This BP cuff looks pretty sturdy and the dial is easy to read and all that but I have had problems getting an accurate reading. The inflating rubber balloon in the cuff does not surround the arm so if you don’t have it just right it doesn’t inflate correctly. Also you have to make sure the cuff is very tight when you put it on or you will be pumping it up for a long time. This makes it awkward using on someone with arms that are much larger near the shoulder and smaller near the elbow. You just don’t get a good reading.